Listening. It is a hard skill to learn. The irony is we have an innate ability to listen. In fact, it has been necessary for our survival as a species. Before we learned to speak, we had to listen to our parents. Before we lived in safe housing, we had to listen for predators. Before we had radio, television or the Internet, we had to listen to each other. Before you can learn a foreign language well, you have to listen to a native speaker. Then, as with any kind of language acquisition, we start to talk and talk and talk, but rarely really hear. In observing my children, I have noticed that their adolescent brain development has made them unable to absorb certain kinds of sounds, such as the words “Clean up your room.”, “That dish belongs just left of where you put it, namely the dishwasher!”, or “Do you really think muddy shoes belong on your feet going up the stairs?” But teenagers aside, we adults have similar issues about listening to one another. We only hear a fraction of what is really being said. A lot of it has to do with our filters through which we process information. She said, “X” so she must mean “Y”. We make up all kinds of meanings to interpret what a person has spoken based on our past experience. But all we have is now. Every moment gives birth to a new possibility, a new world, a new way to enhance your relationships with others. If you let that world in, you wouldn’t believe what happens! All that tangled energy gets released. Blockages, like an ice cube in hot water, dissolve. If we stopped for a moment to really be with that person who is talking instead of with our own brain chatter, we might hear the intended meaning more clearly. We all have our assumptions that we carry into conversations. But imagine what it would feel like to remove those assumptions for just one of them you will have today. Instead of assuming your neighbor will be grouchy, thereby affecting how you will greet her, take away those pretenses with an open mind. Or what if your boss, whom you assume isn’t a morning person, is someone you don’t avoid this morning, but instead approach with the intention to listen to whatever he says. Draw closer and you might find he is dropping clues as to why his face is so mean every morning. Every one of us leaves a trace of what we are really saying in the room; a deep listener can hear it. I’m up for the challenge to listen better today. Are you? That last statement of the pitch was what really hit home. As a long-time blogger, I receive countless pitches from PR folks about their various products, causes and ideas. It is rare that I respond to one, mainly because a good story is really hard to find amongst the massive onslaught of commercialized messages. But this one is a story worth telling. It is a fact that when women are healthier, societies overall are healthier. Global health advocate and former model Christy Turlington Burns is participating in the ING Marathon on November 4 along with Dexter’s Jennifer Carpenter, World Renowned Tattoo Artist Scott Campbell, The Smile Co-Owner Carlos Quirarte, Oiselle Founder/CEO Sally Bergesen and 45 other runners, to raise money and awareness for her non-profit organization, Every Mother Counts (EMC). To expand the reach of this effort, Every Mother Counts is calling on supporters everywhere to create their own team, and participate in a 5K run/walk in their town on November 4 while the EMC team hits the pavement in New York City. Did you know that 5k is less than the average distance a pregnant woman in the developing world must travel to receive the basic health care she needs to deliver her baby? Let’s face it. 5K is simply too far to walk for a woman who is 9 months pregnant, in labor, and has no access to transportation. By walking or running in communities across the country, Every Mother Counts aims to raise awareness of this simple but devastating barrier and empower people everywhere to get involved in helping women to overcome it. How to join: It is as simple as grabbing a couple of friends and going for a 5K run/walk during the official ING New York City Marathon. Make a sign, tell friends on social media about your efforts. Then share your photos and stories with Every Mother Counts on our facebook page or by email at info@everymothercounts.org. 1. Purchase the official Every Mother Counts marathon team shirt for your team and all proceeds will go to EMC. This year, team EMC will be outfitted by Oiselle, a growing women’s apparel company dedicated to female runners and EMC’s official athletic apparel sponsor. You can purchase team jerseys from the “EMC Collection,” on oiselle.com, and 40% of the proceeds will go to Every Mother Counts. 2. Join our Team by setting up your own CrowdRise page here and have friends and family sponsor your run by making donations through CrowdRise. All proceeds will go to EMC. 3. Please use Charity Miles, a free app that enables you to earn 25¢ per mile for Every Mother Counts, whenever you walk or run. It’s a free, easy way to raise both money and awareness for Every Mother Counts. And you can use it any time you walk or run— even if you’re not doing a full 5K. Please download the app to your iPhone or Android today. Every Mile Counts! I’ve downloaded the app, which is based on your GPS so it is best to use outside (and not indoors where I tried to log exactly how much distance I run up and down the stairs all day). You win through exercise. Pregnant women win through the help they need. Let’s run/walk so others don’t have to. Serenity Stewart sang in her minivan. Occasionally, she’d step in front of a choir and do the same. But for years she hid her secret gift of song, in which she had been classically trained, just to get by. With four children to raise on her own, she kept her creative self locked away while she did what she needed to do. Working as an office administrator for a busy health care practice, Serenity ran a tight ship, always looking after others. But that creative self needed to live. It took Serenity’s nearly dying to breathe life back into it. In July 2005 she suffered a brain aneurysm that left her bleeding out of her nose and even her eyes. As she lay on the cold ER table, her last view was of the gorgeous doctor with tan, tight arms scrubbing up for surgery. “God, this can’t be my last vision,” she spoke to the sky. “Look at how beautiful this doctor is. I’ve got some unfinished business to do!” It was this sense of humor that got her through the next months of recovery. For the first time in her life, she started to strip away the layers of “mainstream” as she calls it to really live. In an act of self-discovery, she began to realize that an empty vase has the most potential. “Every possibility starts with courage,” she told me over the phone. She took a year off and sailed around the world. She discovered her passion for deep sea fishing and even caught a marlin off the coast of San Diego. She literally emptied herself out to start anew. Serenity now sings jazz reminiscent of the 1940s. Hers is sultry music that speaks of a long-lost era of community and togetherness. At the end of September she will start her P.S. I Love You tour, which will land her in Paris next March (yes, I’ll be going!). Music helps her and her audience tune into the healing energy that only music can bring. It is a meditation, and a dedication, to life. Listen to one of her songs today. You will be glad you did! Fame. It’s not all it’s cracked up to be. I work with famous people on occasion when I’m on a film or TV set. And what I’ve observed is the pressure they endure on a daily basis, trying to uphold a standard that the public has set for them. It is tiring, taxing and at best, unnerving. Everyone has an opinion of you and if you aren’t in the best of moods, it somehow lands in the tabloids the next day. I see what she means now. The other day I had the chance to drink champagne with several celebrities, but after a day’s work in a dusty studio that smelled of manure and pyrotechnics, I was ready for a shower and some pizza with the kids instead. So I drove the hour home, racing through the door with a heightened level of excitement to see everyone again, only to find my family busy with their iPods, laptops and television sets. Enter the feeling of let down. It’s what my friend Donald calls the moment of doom right before you enter your familiar space at home. You know it will be different than you hope it to be, but hope dies last, as they say. It wasn’t until we had assembled at the dinner table an hour later that I realized why I had run home instead of sipping the bubbly with the stars. It was a moment of belly laughs and connection and jokes with the kids that I wouldn’t have missed for the world. It may have been slower in coming than I had wished, but the love was there all along beneath the distraction of our digital world. Fame can’t give you that. Family can. Have you ever observed the battle of wills between a parent and a child? The parent insists that the kid should eat his vegetables. The child, in his fury, resists. The more the parent demands a certain action, the more the child refuses to deliver that action. The Universe is like that too. When we insist upon something, stomping our feet like little children, we are creating a wall of energy against the very thing we demand. It is universal law. And what we resist persists. Have you ever noticed that too? When we are in fear about something, we automatically show resistance, which sets up the same wall of energy that sustains the thing we wish to repulse. We become attractor points for that which we push away. Insistence is the pull. Resistance is the push. In both cases, we don’t get what we want. And we feel horrible in the process. I have learned a great deal about letting go this past summer. When we spend all our energy hoping to avert the worst case scenario, we are placing all our attention on that which we don’t want to happen. And because we have fed it so much of our power, we are left drained and the fear grows. We then create the very circumstances we wanted to circumvent by our sheer level of concern. Someone once said worrying is like praying for what you don’t want. The next time you find yourself insisting on something (whether to a child, your partner or even God), remember this: what you insist resists and what you resist persists. You can shift a great deal of energy by simply taking a different action. Divert your attention to something else. Move forward without concern. Have confidence that your choice is the right one for you. Surrender, my friends. And do it with all the grace you can muster. In one simple act of loving release, you will be set free. “It’s just a phase,” I would hear my mother say to her friend on the phone. As teenagers, my sister and I had no idea how much we put our mother through and while she says now we were just fabulous, I know the teen years are far from it. With a teen of my own, I get to experience several phases at once: the remembering phase (“God, was I like that?”); the mothering phase (“Because I said so.”); the daughtering phase (“Mom, I am so sorry if I ever, ever said something like that to you.”); and the mid-life phase (“What do I want out of life?”). All that rolled into one makes for some interesting times. A friend of mine once told me I could choose how to view this phase of parenting: as either a gift or a curse. I have chosen to look at it as an opportunity of self-discovery as I witness my children grow into the people they will become. Whether you have children or not, we all go through phases in our lives. Sometimes we are up; sometimes we are down. Sometimes we are suspended on a tightrope, daring ourselves not to look down. While work-life balance experts will tell you that equilibrium is the goal, I disagree. Alignment with your truest purpose, and all the hills and valleys, are what you are here to experience. So what if you topple off that balance beam? Maybe it’s just what you needed to get a different perspective. When we take back our lives with clarity and vision, those valleys seem less frightening. Grab yourself some sentries in the form of friends and loved ones who will stand by you in stormy times. Reach out when you need it. We all deserve that kind of support. Do it with love. Do it shamelessly. Hug out the pain until it slides back into the shadows. We’ve got this life, broken down into units of time. Take it all. It’s yours. Are You Fed Up with Frenzy? If you are fed up with the pace of your life, you’re in luck because there’s a new book out dedicated to hard-working folks like you. Susan Lipman, the brilliant blogger over at Slow Family Online, just penned a book aptly called Fed Up with Frenzy: Slow Parenting in a Fast-Moving World. 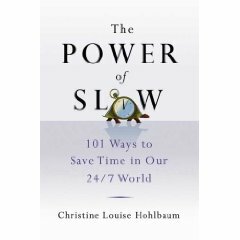 In it she provides parents a fail-safe guide to slowing down to offset the frenetic pace we all seem to be on. It’s a gentle invitation to get off the carousel and step back with doable activities that often require nothing more than our imagination. The book is divided into Slow Activities, Slow Games, Slow Crafts, Slow Kitchen, Slow Garden, Slow Seasons, Slow Celebrations, Slow Travel, Everyday Slow and finally, Slow Parenting. My favorite section is the slow garden one because I love the outdoors and the simplicity of sending the kids outside to explore their backyard (I am reminded of the intention behind TurfMutt, a plant science curriculum for which I also work). I swear I’m keeping it within arm’s reach during the kids’ summer vacation (which just started by the way. Yeah. Bavarians are weird like that). Run, do not walk, to your nearest online or bricks and mortar store to get this guide. You, and your sanity, will be glad you did.